A new plaque coming to the entrance of Carrboro Town Hall will memorialize the town’s roots, including its founder Julian Carr and civil rights efforts in the town. Language for the plague was approved unanimously by the Board of Aldermen this week, after months of work from a task force of residents. The plaque’s language begins where Carrboro first began, at the end of the Carolina Railroad that extended south to the edge of Chapel Hill and the first textile mill that opened nearby. Originally known as West End and Lloydville, and then Venable in 1911, Carrboro received its current name soon after. 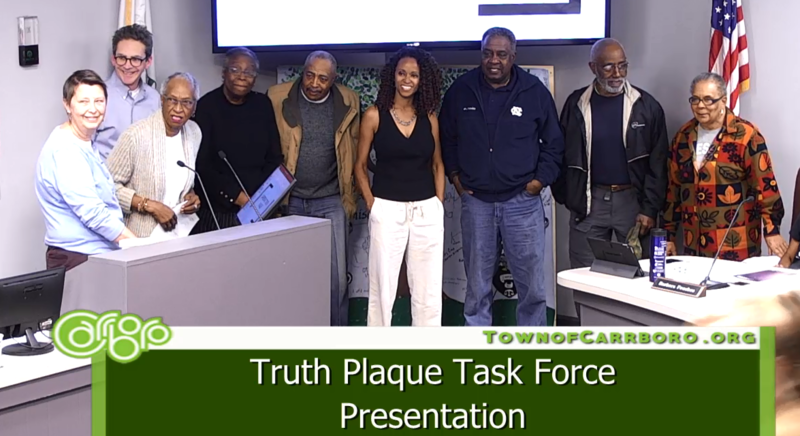 Task force member Rani Dasi read from the plaque’s language at the Tuesday evening board meeting. Along with this plaque’s language, the aldermen approved the task force’s request for further exploration of additional historical plaques on local history. Carrboro’s roots began in the late 19th century when a branch of the North Carolina Railroad extended south to the edge of Chapel Hill, and the first local textile mill opened nearby. Informally known as West End and Lloydville, the community incorporated as a town named Venable in 1911. Two years later, the state legislature renamed the town Carrboro at the request of Julian S. Carr, a post-Civil War business leader. He was also an active and influential participant in Jim Crow era efforts to create a system of racial segregation. Although the town continues to bear his name, the values and actions of Carr do not represent Carrboro today. In the 1970s a group of Carrboro residents joined together to change the town’s power structure and advocate for a community that fully included all residents. Thanks to their commitment, today Carrboro honors its working-class roots while reaching toward the goals of social equity, environmental harmony, and fiscal responsibility.